The wait was long, but it is over. The Rams used the 249th pick to select DE Michael Sam. After all the wondering whether or not Sam’s sexuality would hurt his draft stock, it’s good to see him land with a team that is a great situation. He’s close to home, he knows the area and the defensive unit will be a great fit for him. 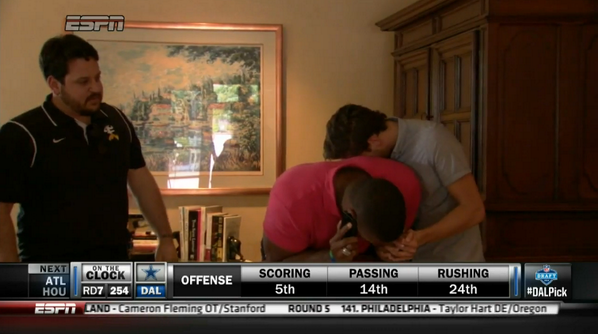 Watching him cry and celebrate as he received the call from the Rams was a beautiful sight. It was amazing. It was a moment in time that will last forever. Since his announcement as being gay, Sam has said that he wants to be viewed as a football player, but not as a gay football player. He knew that shedding that label would take a while. We didn’t know if his stock would rise or fall. We had no idea if the other teams would look past it and just draft him based on his football skills. As much as he wanted to be known just as a football player, he was not that. Even Sam knew that up until today, he will always carry that label of a gay football player. As much as he wanted to be viewed as just a football player, that time wasn’t going to come until he had his chance to become an NFL player. The journey must not have been easy. The wait must not have been easy. The negative insults he’s received since the announcement (and since being drafted) must have been painful to endure. Playing in college knowing that his future could be derailed because of it must not have been easy. But it’s over now. We celebrate an achievement for the NFL, for society, for the world. It’s not a major world-changing deal, but it’s still a big deal in the realm of the ever-changing ways we view people. One day we will reach a time where being gay means absolutely nothing in sports. And I hope it’s soon. We’re not there yet, but I think we’re close. This was a huge step in making that a reality. This first hurdle has been taken and now, it’s all about Sam being a football player. He’s been humble, considerate and strong throughout the entire process. He knew what his placement in the sports world means for so many people. Now we can judge him as a football player. That’s what he wants and that’s what he deserves. But that doesn’t mean we don’t celebrate him for being brave, bold and a pioneer. That will never leave him. Maybe it never will. But maybe because of him, many future openly gay athletes in sports may never have to carry that label. And that’s worth celebrating as well. This entry was posted in Draft, NFL, St. Louis Rams and tagged Michael Sam, NFL Draft 2014. Bookmark the permalink.